NOTRE DAME, Ind.– In a quest to remain in the hunt for the College Football Playoff, the No. 5 Notre Dame Fighting Irish (7-0) went to battle with the Pittsburgh Panthers (3-4, 2-1 ACC). While not necessarily impressive at times, the Irish managed to come from behind and secure their seventh victory, 19-14. Notre Dame looked out of sync early against Pitt. An offsides penalty against Nicco Fertitta on 4th and 4 allowed Pitt to continue a drive in the first quarter. Pittsburgh turned it into a 17-play, 88-yard scoring drive that ate up 9:43 of time in the first quarter and took an early 7-0 lead. Unfortunately, that was almost all of the offense that the Pittsburgh offense was able to squander throughout the afternoon. Ian Book threw an interception on the final play of the first quarter to further the confusion around the Notre Dame offense. Book also fumbled on the first drive of the game, but the Irish retained possession. Justin Yoon split the uprights twice in the first half to provide all the scoring for the Irish offense. Yoon’s field goals of 22 and 41 yards continued to pad his lead as Notre Dame’s all-time leading scorer. Coming into today’s game, Notre Dame was 2-22 under coach Kelly when trailing at halftime. Maurice Ffrench electrified the Pitt crowd and further silenced the Irish faithful when he opened the second half by taking the kickoff back 99 yards for a touchdown. With the score, Pittsburgh extended its lead to 14-6. 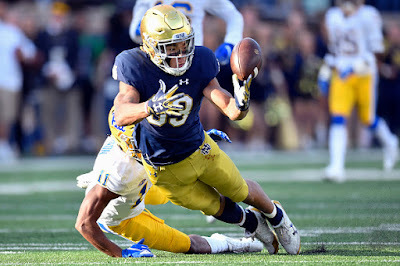 The Notre Dame offense sputtered again when Book threw his second interception of the game, but the Irish were fortunate that Alex Kessman missed a 47-yard field goal attempt wide left. Kessman missed another field goal to open their fourth quarter for the Panthers. Book redeemed his two interceptions by throwing a 16-yard touchdown to Chase Claypool to cut the Pitt lead to 14-12. The Irish decided to go for two, but Book overshot Miles Boykin on the conversion attempt. On the drive, Book completed five passes to Chris Finke and Claypool, with several impressive 15-plus yard gains. Boykin hauled in the game winning 35-yard touchdown reception from Book with about six minutes remaining in the fourth quarter. Book finished the contest with 264 yards of passing on 26 completions. Finke and Alize Mack tied for the Notre Dame lead in receptions with six apiece. Boykin led all Notre Dame receivers in receiving yards with 84 on just four receptions. Te’von Coney led the Notre Dame defense once again with eight tackles on the afternoon, while Khalid Kareem added the only sack on the day. Damar Hamlin led Pittsburgh with nine total tackles throughout the contest. Rashad Weaver contributed a solid defensive performance with five tackles, including one and a half sacks. Notre Dame will head to its bye week before traveling to San Diego, Calif., to take on Navy on Oct. 27. Pittsburgh will also have its bye week following this contest before returning home to take on Duke on Oct. 27.